Gosh the light was weird when I took this photo! The trees are actually peel off stickers, with the difference that some parts are sticky but others aren't, so they have layers which don't adhere to the card itself - giving a 3-D effect. And, needless to say I made another one the same whilst I was playing! Our sponsor this fortnight is 'Digiscrapkits' - over here. You have two weeks to join in with Cuttlebug Mania - hope you find time to come and play! I do so love this stamp - Len says my hair looks like that when I wake up in the mornings! And the 'friend' die is going to be fun to use, cut in plain card it would look great, it could also be used for the camouflage technique - and of course would be super combined with stamped words too. 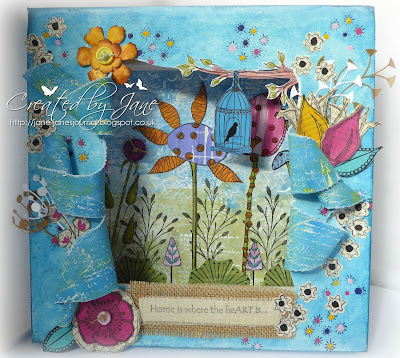 Oh how I love all the detail on this fabulous easel card, made by Jenny L. It's super Jenny!! Eve is on a roll at the moment with beautiful black and white cards, accented with gold foiling and embossing. I picked this one as a lovely example to share with you. 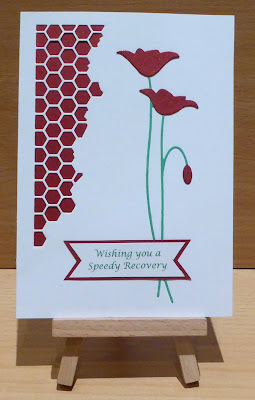 I just love this card, made by Linby. Fabulous use of snippets and a perfect sentiment. This little lady reminds me a bit of Sally in The Nightmare Before Christmas film, only without the stitching on her face. It's the eyes I think! 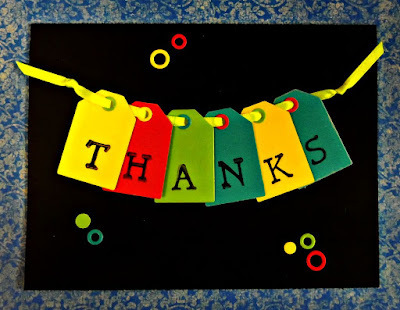 You know that feeling when you see a handmade card or something else on a blog - and it stops you in your tracks? Well, I literally screeched to a halt when I spotted this amazing card made by Donna - gosh it's fabulous and it's all made using dies, a stencil, a stamp and snippets. I LOVE, love, love this!! I chose this card, made by Janis, as it's a great example of how to use up neon coloured snippets - it sure brightened up the day here! This is such a pretty tag that Ileana skipped with in to show us - who wouldn't feel better if they received this? Yay! Cornelia came to play a couple of times this week - first of all bringing us this fabulous card to share. It was published in Craft Stamper magazine and I'm not surprised. The great news is that Cornelia is well on the mend after the retina repairs - but for now she's gonna be sitting out playing on the seesaw, just like me! This first one was made by Brenda (Floral Fantasies), and I think it's just absolutely gorgeous. And loads of you who visited her also thought the same - there's a great explanation of how Brenda made this beauty on her blog as well. And finally, here's another canvas - this time made by Jane J. She used a technique I'd never come across before called 'Slashed Canvas' - it's amazing! I've read the steps a few times on Jane's blog and now have a good idea about how it was done. Would love to try it and I wonder if anyone else dares have a go, another great way to use snippets! So cute!! And starting off really young too. I was delighted to see Donna's number come up (the first two runs of the Random number generator picked two Playmates who had already declined the chance to win so it was third time lucky for Donna!). And not only that, you'll have seen that Donna's fabulous scenic card blew my socks off this week - and you know what? She truly doesn't realise just how good she is. Donna came to play for the first time the week before last and has only been blogging since February - so this is a fairly quick win, and very well deserved. To date she has just 17 followers - I just bet (and very much hope) a few more of you will hop over and start to follow her after seeing her work! Can you please let me have your snail mail address Donna, and I'll post your prize off this week (di_wray@hotmail.com). It's a Winnie and Walter 'In a Word: Friend Cutaway' die and a Marianne 'Don and Daisy - DDS3324' stamp, just like the ones I used on my snippets card today. The Snippets Challenge will run for one week and the Playground gates will close at 11am UK time on Saturday 3rd October. The gates will open again at midnight UK time on the same day. Maximum of three entries and please say in a comment if you wish to play and be a possible winner of the prize. Do say if you only want one or other part of the prize (the die or the stamp), but both are up for grabs as one prize of course. And please also link back to the Playground in your blog post to be eligible for the draw. Progress with the back is slow but it's steadily improving - bit by bit we'll get there! Yay, it's Rudolph Day again, over at ScrappyMo's - HERE. And, it's also Craftyhazelnut's Christmas Challenge #247 'Something beginning with P' - as well as Craftyhazelnut's Christmas Challenge Extra for September 'Always anything goes'. - next, a red peel off sentiment - had totally forgotten I had a sheet of red ones! I made some cards in a similar style for last Christmas, although they were bright neon colours and much more modern/funky - HERE. And, of course, I made another one exactly the same as the one I showed at the top of this post - which means I've hit my target for September of 12 Christmas cards - so that makes 108 made so far this year. Whoop, whoop! Oh help - he'd only brought a girlfriend to dinner! And we don't think dinner was the only thing on the menu either. The worry is, if there are little 'Spikelets' in a few weeks time as a result, we'll be doing the hedgehog rescue palaver all over again. I've wanted to make a 'Minions' Birthday card for ages now, using the Stampin' Up Owl punch. Recently I got the chance to make one for one of Len's little relatives - and they really are such fun to make, if a little fiddly! I used some words I'd seen whilst looking for the Minions tutorial, just printed them on the insert .................. 'Sending you Minions of Birthday Wishes'. Writing this on Saturday morning, and for the first time in over a week I can feel the teensiest improvement in the old back. It's the nature of it that it travels around different areas - almost as if when I protect one sore set of muscles it then moves onto another area. Nasty piece of work if you ask me! So, that's my snippets card for today, and it fits nicely in with the current challenge over at 'Merry Monday #171' which is 'Sentiment in the Spotlight'. I think I covered the Merry Monday brief - n'est ce pas? And now onto this week's picks - sheesh, a lot of entries and also many of you were keen on the Tim Holtz prize on offer. Who knew? I truly thought I was 'tail end Charlie' with those birds, once again! Carol L always features on my weekly list of possible picks at least once, usually more times. 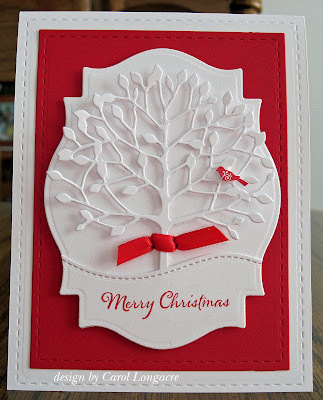 I chose this entry as it's a perfect Christmas card - using the wonderful Arboscello Tree die by Memory Box and just so pleasing to the eye. Love it! 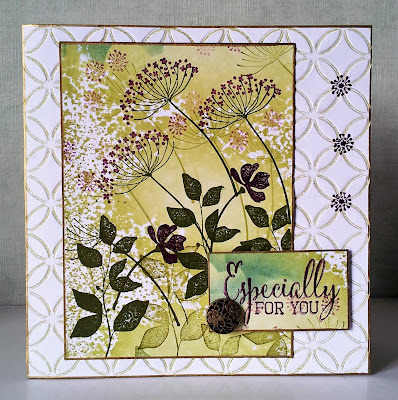 I certainly went WOW when I spotted this absolutely gorgeous WOW card, made by Viv. Just perfection and so, so beautiful - welcome back Viv! Viv has been travelling round the country in her role as Vice-President of England Bowls for what seems like ages now - we missed you chick! I'm sure that many of you know that Bonnie is on the DT for 'Merry Monday' - one of my favourite challenges. And this is the latest DT card she brought to show us. Now, I thought it was all one stamp that Bonnie had used - but not so! That little beauty was made by careful selection and positioning of a variety of Christmas sentiment stamps. So clever and one I bet a few of us would love to CASE! Slightly sick grin here, Bonnie has a Misti Stamp Positioner - am totally green around the gills with envy. I do so wish someone in the UK would stock them - right now the postage and also the risk of paying duty is quite off-putting, such a shame! And here's another Christmas card, made by Annie. And certainly one I'd love to CASE as well. I just adore the idea of die cutting the bauble from the front of the card and then popping a snippet of sparkly card or paper behind the aperture! Great idea and so effective too! 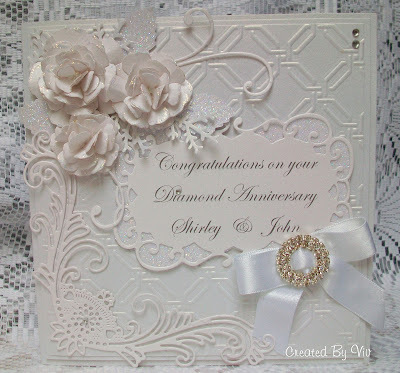 I love this card, made by Lynn, using snippets of white card and transforming them into this real beauty! What's interesting too is that the shades of white vary - but of course when you create wonderful stamped and inked backgrounds it really doesn't matter, so don't throw those slightly off-white snippets out girls! 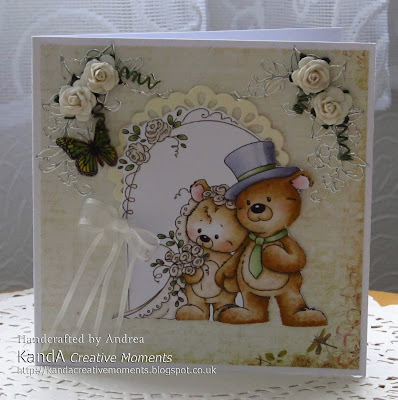 Kate hopped in with this stunning card - some beautiful die cutting, wonderful flowers too! What really made me smile was that Kate used a snippet of wallpaper sample on the card. Such a great idea - I'll be off to Homebase as soon as am more mobile :) Tee, hee - and able enough to beat a hasty retreat with an armful of wallpaper samples! Oh I do so love this card, made by Laurie! The die is a Cheery Lynn one called 'Witch's Laundry' and it's such a fun die - a perfect way to use up snippets too! I'm sitting on my hands here but bet that one of these will fall into my shopping basket over at Maddy Lisa's before the day is through! Chris S brought us a gorgeous snowflake Christmas tag to see - I love all the blues and it looks so Nordic, just beautiful Chris! Donna nipped in with this great card - the film strip die is a perfect way to personalise cards I think! Donna also has a trick for stopping tent style cards from splaying out (and looking like a ballerina doing the splits!) - she kindly sent me instructions but I haven't cracked it yet - to be honest I think I was doped up on painkillers when I had a play, so must try again! So I know you'll all be delighted for Liz - I'm sure she'll be back soon with some fun cards using the stamps and dies! Psst, I still have your snail mail address Liz and will post your prize ASAP this coming week! This coming week's prize is another 'no brainer' of course. 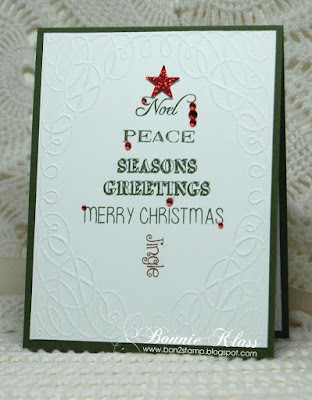 It's a Sizzix card front die called 'Peace, Love, Joy', just like I used on my snippets card. I've also got a packet of A5 'Stick-It's sheets as part of the prize. This is such a detailed die to stick down and I do think the Stick-It sheets are a bit of a life saver. I thought it was time to throw a Christmas prize into the pot now and then - Autumn is on the way and quite a few of you are thinking about making Christmas cards already. The Snippets Challenge will run for one week and the Playground gates will close at 11am UK time on Saturday 26th September. The gates will open again at midnight UK time on the same day. Maximum of three entries and please say in a comment if you wish to play and be a possible winner of the prize. Do say if you only want one or other part of the prize (the die set or the 'Stick-It' sheets), but both are up for grabs as one prize of course. And please also link back to the Playground in your blog post to be eligible for the draw. Out of the 'shop bought' Christmas cards we've received in recent years, I've kept quite a few that seemed to have potential for upcycling. There was one square card which I kept looking at - a plain black background with a pretty printed wreath of holly, white flowers and some red glitter - with a lovely die cut 'Noel' sitting in the centre, popped up on a dimensional sticky pad. - using the largest die, cut a circle from the 300gsm white card stock - and left it in the die. This was because I was using this largest circle of card for the rocker base and, yet another great thing with these Tonic Studio dies, they have a little notch at each 'quarter hour' of the die for precision. So, I marked the card at opposite sides using a pencil, removed the piece of card from the die - then lined the pencil lines up on my Hougie board and scored down from one mark to another. rubbed out the pencil marks and (with heart in mouth) folded down the score line to form a half circle. Result! A perfectly lined up rocker base - yay! Back to the Tonic Studio's set of circular dies, it's absolutely brilliant! As the name suggests, it consists of circular dies - but the fabulous part is that there are 14 dies in the set ranging from 14cm down to 2.5cm and they come on a magnetic sheet within a hole punched pouch (ideal for popping in the front of my 'frame dies' file). I just looked online and there's a great offer over at Amazon.co.uk at £14.72 with free delivery, a saving of 36% (I know I paid much more than that price for the set I bought a while back). The largest die still fits my Cuttlebug fine yet is big enough to cut a circular card - and although the blurb says the dies will cut up to 240gsm card stock, I used 300gsm white card stock and it cut with no problem at all. One of my all time favourite everyday die sets for sure - even though I already had a Spellbinder Nestabilities set. So, this card is for Craftyhazelnut's Christmas Challenge 246, where it's 'Festive trees or greenery,' and also Craftyhazelnut's Christmas Challenge Extra for September - where it's always 'Anything goes'. Less is More - Week 241 - Wishing! The current challenge over at Less is More is 'Wishing' - but with the twist that we all love so much, it's one layer - sigh. Kept it at that - and needless to say the brush marks of the gold WOS don't show up as much in real life. Who said the camera never lies? It might not lie but it sure does exaggerate! Hi folks! The Cuttlebug Mania Challenge this fortnight is 'Wheels' - anything with a wheel or wheels will count and it doesn't have to be the die cut or embossed part of your card of course. I had several options in mind when making my DT card, including a few stamps - but opted to play with a die. Our sponsor this fortnight is 'A Day for Daisies' - a lovely digital stamp shop. - from the centre of the burgundy square I then die cut a scalloped circle, using a Spellbinders Nestabilities die and put it aside - needs must as that was the only piece of burgundy card I had! - then added the (trimmed to a slightly smaller size) patterned paper, which is from Prima's 'Stationer's Desk' paper pad - love this pad! So that's my DT card for this fortnight's Cuttlebug Mania challenge - it would be lovely if you come and play! And, I'm entering this into Darnell's current NBUS challenge HERE. It's my third and final entry and wow, she has loads of amazing sponsors - and all you have to do is to use some 'Never-Before-Used-Schtuff or NBUS for short' as Darnell calls it - mine was the penny farthing die! Just think, you could make one card and play along with the Snippets Playground, Cuttlebug Mania and also over at Darnell's! Thankfully this card/post was already made/scheduled! ............whilst I truly did think I did well on the Birthday outing on Friday with Len, as often is the case two days later, right now it feels like a combination of being kicked and also having a set of huge crab claws grinding into my back/ the right hand side of the middle of my spine. Something I expect a lot of you can relate to. Managing with a load of pills though. Rattle, rattle!! Am trying my best to keep on top of commenting in the Playground, but my biggest worry is that I owe so many of you my love and thanks for wonderful emails, plus snail mail cards and gifts. Please bear with me - I'll be back (snort!) ASAP. And yet another week flew past, we're almost into Autumn here in the UK, but with some lovely sunny days thrown in still. But, I just bet the shops will be full of Christmas stuff before long - if they aren't already! This was such a fun card to make - gotta love those Crazy Birds :) Hope you had a great day Moira! I'd like to make this my second entry into Darnell's current NBUS challenge - all the Crazy Birds stamps, dies - and their accessories were unopened and unused before I made this card. Do join in the fun - there are loads of lovely prizes to be won and of course you get to use some of that NBUS stuff you haven't played with before! Straight onto this week's picks, which of course were chosen by Sarn - who did a fabulous job of commenting and looking after the Playground this week. There were times I thought it was a bit like her having to herd cats - and who knew that a simple game of 'tag' could end up with so many bumps, bruises and a donkey's tail pinned on Mrs A!! Thank so soooo much Sarn! And here's what Sarn says about her time as Playground Prefect: Can I just say it's been great fun being Prefect this week and thanks to the playmates for being such good sports and playing tag nicely (apart from the donkey tail pinning incident of course!). If anyone else fancies being Prefect for a week, I know Di would love to hear from you. 20: KandA HERE. 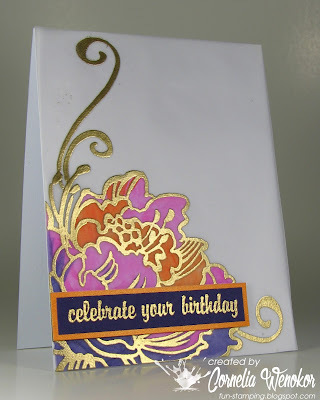 Because I think it's a cute card, beautifully coloured and toned in and prettily embellished. 34: Julieanne HERE. Great masculine card with lots of snippet layers. 46: Jane's Journal HERE. It's just so amazing with all the work that's gone into it and NO stamping allowed! 56: Lynn Hayes HERE. 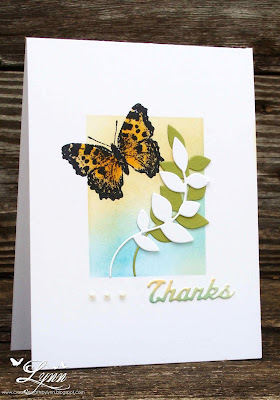 Love the multi-inked square butterfly flying outside of it, plus the matching die cut sentiment. The layout is so pleasing to the eye. No 67: K T Krafts (Kathy). . .HERE. I just HAVE to add this card to my picks . . . because it is right up my street and uses my fave stamp set. (This was a really last minute addition from Sarn at 10am yesterday morning - which shows just how much we try to keep the picks absolutely up to date, until the very end stop when those gates clang shut each week). Keeping up to date is also the reason why I pick the previous week's winner right away as soon as the gates close - I know (and totally understand why) a good few challenge work a week behind. But, it's fun to wrap one week up properly before moving onto the next one. Sarn also said: Oh my goodness it is SOOO difficult picking out cards as they all have their merits. Thank you so much again Sarn, wonderful picks although I do so agree about choices being so difficult! It's been a huge help having you on board this past week, especially as there's been a lot going on here. No new little Playmates this week, but we still had 68 entries - am gonna need to get more swings etc. before long! Well done Andrea, I have your address and will let Sarn know as the prize will be sent to you directly by her. Isn't it strange, the last prize you won here was the set of Sarntangles stamps, some time ago now - maybe Sarn is a good luck talisman/rabbit's foot? One reason why this past week has been busy is that yesterday was my Birthday so Len took me out for a day at Longleat on Friday. We had a great day, the weather was so kind to us and with a heat patch on my back, rattling with pills and also a cushion for the 'off the road' ranger tour in a Land Rover around the Safari Park I coped pretty well. The tickets were bought a while ago and the date had been booked so we had to go through with it. We did laugh, after all the bouncing round in the Land Rover I felt my back for the heated stick on pad - and it had slid down into my knickers - wondered why my bum was so warm! A HUGE thank you to everyone who sent me cards, Facebook messages etc. - I will thank you all individually but my time at the laptop is still being limited. Anyhow, to celebrate my Birthday I planned a bigger prize than usual for this coming week as a thank you for all the fun and laughter - plus your fabulous snippets makes of course! Yup, the prize is the Bird Crazy stamps and die set plus the accessories set that I used for my snippets card today. Not my own ones you understand - these are new and unopened of course! Ideally, this should all be one prize, so that's what the offer is - all three items. BUT, I've been sitting on this prize for a few weeks now, fretting watching quietly as more and more of you succumbed to the 'Crazy Birds' and there was nothing I could do but hang on. But, if you already have all of this prize, we have tons of lovely prizes coming up in coming weeks and I know hope that they're just the icing on the cake really. Now, maybe you only have some of the prize and would like (say) the accessories and/or the dies 's cos perhaps you already just have the birdies or maybe you just have the dies only (err, who would do that?). It's absolutely fine to pick and choose - please just say clearly in a comment which you would like to win - remember you can have all three items as they are a bundle first and foremost, but I will split them if you want to add to your TH Bird Crazy stuff and you get picked as a winner. It might even be that someone would only want the bird stamps, to have a play with and that's fine too. First out gets their choice and then if necessary I'd just keep re-running the random number generator for second/third prizes. The Snippets Challenge will run for one week and the Playground gates will close at 11am UK time on Saturday 19th September. The gates will open again at midnight UK time on the same day. Maximum of three entries and please say in a comment if you wish to play and be a possible winner of the prize. Or, as explained above - just one or two parts of it! Do remember that you should also link back to the Playground in your blog post to be eligible for the draw.